Today we are interviewing non-fiction author Billy Joe Davis. Describe the content of your book in a few sentences. 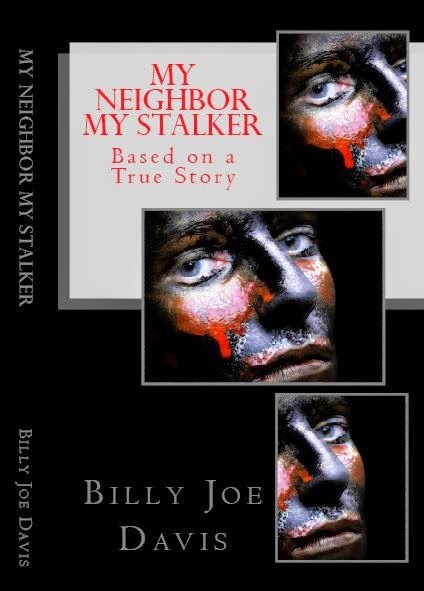 The book “My Neighbor My Stalker” is about my personal experience and what happened to me as a result of befriending a convicted stalker unbeknownst to me. Ive also tried to include helpful information that I’ve learned along the way to educate the reader so that they may possibly avoid a situation like mine. Unbeknownst to many there are different types of stalkers and mental profiles. Who (age, gender, etc) do you think would most benefit from reading this book? I think the full adult age range would benefit from reading this book, because we take so much for granted on a daily basis when dealing with people, we assume because we haven’t done anything overtly close to attracting any type of criminal element or mentally ill individual, stalking couldn’t possibly happen to us. I guess you could say I have been writing off and on since I was in elementary school my first sister gave me as a birthday gift one day one of those zipper diaries that you would give little kids or teenagers, that’s when my interest in writing began. I think I also benefited from the fact that when I was very young, my fathers side of the family that lived far away from us was very big on letter writing. My mom would read the letters to me and allow me to help in responding to the letters. Actually I think e-books are wonderful thing. I think the ebook gives a voice to many individuals out there that wouldn’t otherwise be able to afford to speak their mind give their opinion and tell their story to the public. I also think it’s revolutionized the way we can receive and process information anywhere anytime so long as we have a computer, tablet or cell phone. If I had to wait to be able to afford an editor and a book publishing company or book deal most likely my stories would never be told, just as I’m sure thousands of other individuals would have to remain silent. It would be wonderful to be able to support myself financially through my writing. I’m hoping that I’m able to continue my writing and that eventually my books reach a wider audience. I would like my readers to benefit and learn from the mistakes that I’ve made in my own life. Over the next 10 years I would like several of my real-life experiences to be published and become widely read. I wish I could say I had lots of support, but being that most of my family’s deceased and the particular experience that I’m describing in my current book is pretty much scared away or frightened most the individuals and people that I knew so as far as writing I’m pretty much alone in this, other than my readers. Since you’re still going through this ordeal that you read about in your book, how are you currently doing now? Well I’m currently developing my next book and trying to deal with my current situation as best I can and struggling to keep my utilities on and the city has recently placed a lien on my home for back taxes, so I’m doing my best to hang on to my home at present time receiving and receiving of help from no one, except my first sister from out of town is helping me keep my utilities on but it’s an everyday struggle. You mentioned having a neurological disorder several times would you like to explain to your readers what you mean by that? When I was very young I suffered a severe episode of scarlet fever immediately followed by several severe episodes of rheumatic fever and then Lyme disease. This was in the late 70s early 80s when there wasn’t very much information about the conditions of rheumatic fever and Lyme disease I was told by the doctors when I was in middle school that later on I would develop problems for many of the physical even though I did suffer physical problems from a very young age the neurological disorders didn’t show, I forgot about most of it till I was much older sometime in my mid-30s I started experiencing memory problems occasional problems with speech and problems with writing what I was thinking in my mind wasn’t necessarily the exact words I was putting down on paper and occasionally I would repeat words without realizing that I had done it, is kind of a mixed bag but I’m trying to do with it as best I can. Is there any advice you have for readers? I would like to say that although I know it’s difficult in the pursuit of a normal everyday life that he can be very hectic, I also think that if possible you should try to pay a little more attention to your surroundings and the individuals that you interact with on a daily basis, if you feel something is suspicious or odd to you, follow up on it don’t ignore it. When I suspected there so that was something that might be wrong I kept telling myself that I was paranoid and I ignored all the very subtle warning signs. Well obviously editing is not something that I look forward to. I do try my best, so I review my work several times I do catch the majority of my mistakes but I know that there still will be mistakes that remain due to my neurological problems I know that some of the sentences something that I read will look okay to me and I won’t catch all of the errors. I wouldn’t say necessarily that I would call it writer’s block I think it’s more the problem that I have with depression that even though I can lie down in the middle of the night and think my words carefully and they float beautifully in the silence, but for me to get up and put them down on the keyboard is somewhat difficult and I have to actually look at the words proving to myself that what I’m talking about actually happened personally to me and wasn’t just a nightmare, if that makes any sense to the reader. I use a computer, I just think it’s much easier for rearranging my thoughts and corrections. I’m hoping that my next project will either being the 10 to 13 year experience I had in an unusual ongoing relationship or my experience with sexual harassment in the workplace, my horrible and surprising ordeal with the EEOC and how it impacted my daily interaction with others. I would like the reader to know that my main purpose of this book was to get the word out that no matter how impossible you think something is to happen to you there’s always that tiny possibility that it can happen to you, remember the old saying, when you least expect it. Thank you so much for giving me an interview, I appreciate it and I sincerely hope that my books help people out there. Direct email: williamdecade1 at yahoo dot com. Please put author Billy Joe Davis in subject line along with your name.